It wasn’t the scoreline they would have hoped for in their final home game of the season, but it was unsurprising given they had lost 9-0 away against the Haws last time around. They were trailing 6-0 at the break in that game but held out for some 25 minutes in this match before the visitors took a firm grip of the encounter. They led 3-0 at half-time before a further four goals were fired in as Arniston were condemned to their 14th league defeat of the season and in ninth place in the table. The Haws had opened strongly against Arniston with a third minute shot from Charlie Denton hitting the Arniston post before Shaun McCallion saw his effort slip just wide of the target at the other end. The Fifers broke the deadlock on 26 minutes when a cross from the left was met with a fine glancing header from Michael Watt. It was 2-0 to the visitors shortly after as Watt raced down the right wing and swung in a cross which was slotted home from close range by Joe Kirby. 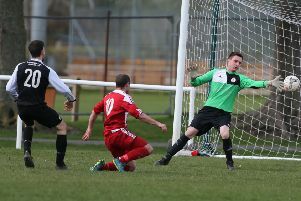 Jamie Newman pulled off an excellent double save to deny the visitors but he was powerless to prevent Hill of Beath from extending their lead on 38 minutes when he was beaten by a clever Kirby shot as goals continued to flow. Arniston showed a bit of fighting spirit after the break but it was snuffed out when the visitors were awarded a penalty as Andrew Fleming was adjudged to have brought down Denton. 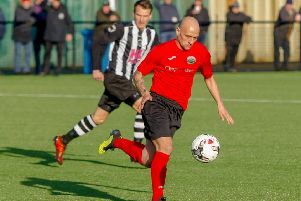 Darren Wright dispatched the penalty away to make it 4-0 and a case of damage limitation for the Gorebridge outfit. It was soon five as Shaun Leishman pounced in the box as Arniston failed to clear their lines from a free kick. Arniston nearly grabbed a consolation when a fine run by Andy Watson set up Jones but he fired wide of the target. The Haws were not finished as a fine lob from Greig Smith and superb shot from Jake Mitchell in the final minutes completed the rout. Arniston Rangers: Newman, Arthur, Liddle, McDiarmid, Andrew Fleming, McCallion, Horsburgh, McDonagh, Jones, Watson, Norris. Subs: Joyce, Samson, Raymond Fleming, Power.